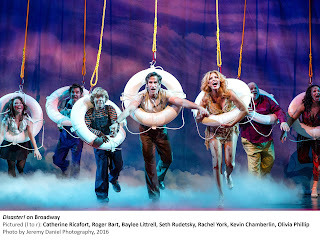 This artfully tacky musical spoof of that beloved genre known as the disaster movie has made the improbable move from Off-Broadway to the Great White Way with an all-star cast. Utilizing songs from the 1970s, the era during which these films reached the zenith of their popularity, creators Seth Rudestsky and Jack Plotnick (who also directed) have crammed every imaginable cliche into this story of a corrupt casino owner (Roger Bart) who builds a floating casino and disco called The Barracuda off a New York pier and scrimps on the safety code requirements, leading to predictable chaos. On board is a glamorous, second-rate lounge singer (the decidedly first-rate Rachel York) and her twins, Ben and Lisa, played most amusingly by Baylee Littrell, the “disaster expert” (co-creator Rudetsky) warning of impending doom, a cheesy suburban couple (Kevin Chamberlain and Faith Prince, the latter in her most amusing role since Miss Adelaide in the “Guys and Dolls” that made her a star), a waiter (Adam Pascal, back at the same venue as his "Rent" breakthrough, and still sounding great) with a crush on the girl he broke up with years before who’s now an investigative reporter (Kerry Butler who excels as she did in that other movie spoof “Xanadu”), another waiter (Max Crumm) who’s helpless with the ladies, a washed-up soul singer (lovable Lacretta Nicole), and most hilariously, a nun with a gambling addiction (peerless Jennifer Simard). Before long, the casino is beset with earthquakes, floods, fire, before, inevitably, flipping upside down. The 70’s hits (e.g. “Hot Stuff,” “I Will Survive,” “Without You,” “When Will I Be Loved” -- come fast and furious -- sometimes sung in full, other times, in snatches. And it must be said they are most skillfully integrated into the script, not true of most other musicals that shoehorn existing hits into a new script. The sound is abrasively loud but, as jukebox musicals, go, this one’s way more fun than most. The cast is chock full of Broadway savvy pros all cavorting with just the right satiric spirit. Even in such classy company, Simard’s Sister Mary Downy is a rib-tickling standout. Deliciously dour in her dialogue delivery as she tries to warn patrons of the sins awaiting them within, she surprises with a powerful voice as she fails to suppress her passion for a gleaming new slot machine (“Never Can Say Goodbye”). Rachel York is also outstanding as a sort of Marilyn-esque chanteuse, demonstrating powerful pipes when she cuts loose. Prince, channeling Shelley Winters in “The Poseiden Adventure,” is sweetly endearing and riotous as her terminal illness, with it’s Tourette-like symptoms, comes to full flower. 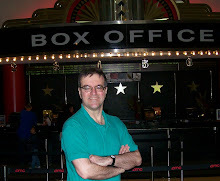 I didn’t see the Off-Off and Off-Broadway productions of "Disaster!" in 2012 or 2013, but it’s clear from clips on YouTube that Tobin Ost’s sets are far more elaborate, though still intentionally rinky-dink. Some of the visual gags, like a piranha-filled fish tank, are quite witty. William Ivey Long’s costumes -- perfect spoofs of their models -- add to the fun. The show won’t be everyone’s cup of tea and is certainly slight; the friend who accompanied me, for one, was grumpily not amused. But, generally, I had the sense that everyone around me was having as enjoyably silly a time as I was.